This film: Look at what a scoundrel Alauddin is... about to marry one woman, he sleeps with another! He is a louse who feels he must have every beautiful woman! Also this film: Ratan Singh is a true romantic. Traveling to get a gift for one queen, he meets another, a beautiful woman, and must have her, so he proposes. Yes, that is one of the odd things about the movie. All the men are characterized by being caught up in wanting or enacting an illicit look that determines their fates. Ratan Singh and Alauddin are paralleled heavily throughout the film, with neither really coming out looking very good for allowing their flawed desires/ideals to rule them. Singh is trapped by the "rules" he feels he must follow even as they ultimately will lead to the loss of everything, while Alauddin believes in nothing but himself, scorning any rules that would prevent him from getting what he wants, but that is what makes him unworthy. The characters are embodied very differently as well, almost as if suggesting a clash between modernity and legendary past and/or thought and feeling in a symbolic form. Singh is barely human in his lack of affect while Alauddin is nothing if not excessive in his shows of emotion, unable to contain himself at all. It's another Bhansali film where the ending is given the feeling of triumph while simultaneously being a total defeat. The feeling of being trapped in roles is strong and on par with the other movies of his I've seen, but made even more absolute here. There were some seriously uncomfortable Islamophobic overtones to this film, to say nothing of the glorification of a "death before dishonor" mindset when it comes to women and the practice of jauhar, and there was a not insignificant amount of controversy and violence surrounding the movie's release. Knowing something of said controversies before I watched the movie, I decided to just turn my brain off and watch the pretty pictures. On that level, the movie is lovely: lush setpieces, beautiful costuming, ludicrously beautiful people. But oh wow, did the movie seriously test my commitment to not engaging with it critically. So many #problematic things. I only really got through it by thinking of it as mythology or symbolic like the original poem was (something something men destroying themselves for an unattainable ideal). As spectacles that don't hold up under close examination go, I have to say I preferred Bajirao Mastani. Hard to know exactly what to make of Bhansali. He constantly pushes buttons, but does so in weirdly contradictory fashion, which I think is the point, but it's not an entirely clear one. He's a talented filmmaker with a very singular sense of aesthetic and values, feeling free to borrow from history and address controversial themes to suit his ends more than actually deal with them in their own larger social context. The movies all are of a piece, but some of the surface elements work against each other while he maintains his overriding interest in personal themes. Bajirao Mastani has to almost be seen as a part of a grouping with this movie and Ram Leela, for how similar they are in many ways, including the stars and basic plot outlines around forbidden love, but each movie goes in a slightly different direction from the other. Alauddin shows Islam as totally destructive and amoral, while Mastani is steadfast and sacrificing, albeit in a rather extreme way that raises other sets of questions. 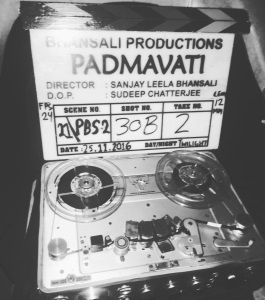 However one feels about Bhansali's films on their surface, I don't think leaving there is ultimately the best way to look at his movies for how much that surface is undercut by other elements of the films, especially when taken as a body of work. That of course doesn't mean anyone should like them, but I don't think the best sense is made of them by just noting the plot elements and character emotions alone. The jauhar scene, for one example, makes a notable close up of both a scared little girl and a pregnant woman that seems to carry at least some strong implication that their choice of ending doesn't quite fit the celebratory attitude. The character's views and relationships too seem more complicated regarding who is proved right or more right and how as things develop. Nagmati seems a weak character, but sees things in ways the others don't and is ignored. (Her role being a reminder and variation of Priyanka Chopra's character in Bajiaro Mastani, just as the mother's role in Mastani was an echo of the mother in Ram Leela). Padmavathi is more aware of what is happening than Ratan Singh, but is only sometimes listened to and her choice of banishment for Chetan sets the rest of the events in motion towards their inevitable end thanks to Singh's resolute nature. Malik is likened to Chetan in sneaking an illicit view of Alauddin and his new bride, but Malik is looking at Alauddin rather than the woman. The audience is asked on several occasions to feel empathy for Malik's position while also showing him as Alauddin's eager weapon, giving a sense of decadence about the character that can read as homophobic and/or sympathetic depending on emphasis. The four main male characters all are shown to be deeply flawed and less aware in some important ways than the women in the movie, which seems to hold for the other Bhansali films I've seen. The women suffer because of the men's actions, which arise from acting out of impulse. Even the way Bhansali films his movies is pretty unique, suggesting both great scale or scope to the world in the movies, but with a narrowed focus, with few notable characters, a tendency to speak in metaphor (most notably in the What is? interrogation from Chetan), and actions being so heavily weighted with meaning in each scene, both visually and thematically, that the movies feel more like allegories than epics despite the scale. I think the movies are fascinating, but with some deep ambivalence in the contradictions they contain. They definitely fit the director as author concept of movies if nothing else.